Evacuated tube collector on a rooftop. 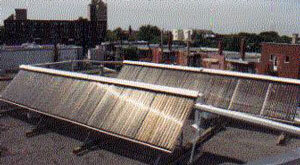 An evacuated tube collector is a type of solar collector that can achieve high temperatures, in the range 170°F (77°C) to 350°F (177°C) and can, under the right set of circumstances, work very efficiently. Evacuated-tube collectors are, however, quite expensive, with unit area costs typically about twice that of flat-plate collectors. They are well-suited to commercial and industrial heating applications and also for cooling applications (by regenerating refrigeration cycles). They can also be an effective alternative to flat-plate collectors for domestic space heating, especially in regions where it is often cloudy. For domestic hot water heating, flat-plate collectors tend to offer a cheaper and more reliable option. An evacuated-tube collector consists of parallel rows of glass tubes connected to a header pipe. Each tube has the air removed from it to eliminate heat loss through convection and radiation. Evacuated-tube collectors fall into two main groups. These consist of a group of glass tubes inside each of which is a flat or curved aluminium fin attached to a metal (usually copper) or glass absorber pipe. The fin is covered with a selective coating that absorbs solar radiation well but inhibits radiative heat loss. 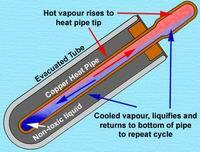 The heat transfer fluid is water and circulates through the pipes, one for inlet fluid and the other for outlet fluid. Direct-flow evacuated tube collectors come in several varieties distinguished by the arrangement of these pipes. Concentric fluid inlet and outlet (glass-metal). These use a single glass tube. Inside this is a copper heat pipe or water flow pipe with attached fin. This type of construction means that each single pipe can be easily rotated to allow the absorber fin to be at the desired tilt angle even if the collector is mounted horizontally. The glass-metal design is efficient but can suffer reliability problems. The different heat expansion rates of the glass and metal tubes can cause the seal between them to weaken and fail, resulting in a loss of vacuum. Without a vacuum, the efficiency of an evacuated-tube collector is no better, and may be worse than, that of a flat-plate collector. Separated inlet and outlet pipes (glass-metal). This is the traditional type of evacuated-tube collector. The absorber may be flat or curved. As in the case of the concentric tube design, the efficiency can be very high, especially at relatively low working temperatures. The weakness again is the potential loss of vacuum after a few years of operation. These consist of a metal (copper) heat pipe, to which is attached a black copper absorber plate, inside a vacuum-sealed solar tube. The heat pipe is hollow and the space inside, like that of the solar tube, is evacuated. The reason for evacuating the heat pipe, however, is not insulation but to promote a change of state of the liquid it contains. Inside the heat pipe is a small quantity of liquid, such as alcohol or purified water plus special additives. The vacuum enables the liquid to boil (i.e. turn from liquid to vapor) at a much lower temperature than it would at normal atmospheric pressure. When solar radiation falls the surface of the absorber, the liquid within the heat tube quickly turns to hot vapor rises to the top of the pipe. Water, or glycol, flows through a manifold and picks up the heat, while the fluid in the heat pipe condenses and flows back down the tube for the process to be repeated. An advantage of heat pipes over direct-flow evacuated-tubes is the "dry" connection between the absorber and the header, which makes installation easier and also means that individual tubes can be exchanged without emptying the entire system of its fluid. Some heat pipe collectors are also supplied with a built in overheat protection – when a programmed temperature has been reached, a "memory metal" spring expands and pushes a plug against the neck of the heat pipe. This blocks the return of the condensed fluid and stops the heat transfer. Minimum tilt angle of around 25° in order to allow the internal fluid of the heat pipe to return to the hot absorber. Evacuated-tube collectors get much hotter than flat-plate collectors. The high temperatures they produce, which can exceed the boiling point of water, can cause significant problems in a domestic solar water heating or solar space heating system. It's therefore crucial to make sure there is always an adequate load on the system to keep the temperatures below 100° (212°F). The glass tubes are fragile, especially so since they are made of annealed glass, which is much more delicate than tempered glass. Care must be taken when transporting and handling the glass tubes. Finally, evacuated-tube collectors, unlike flat-plate collectors (the surface of which is always warm), do not shed snow. Because the evacuated tubes are such good insulators, little heat escapes them and the snow that accumulates on the tubes can stick for a long time. Their surface is also irregular, so snow packs between the tubes, rendering them ineffective, and the fragility of the glass tubes makes it impossible to scrape the accumulated snow off.